I was just waking up. I could hear 12 midnight being chimed in the distance. I was cold, wet, and coming down from the DTs. I looked up and could see the underneath of a wharf above me. After resting on the wharf, he examined the object and saw that it was a bag with latches. When he opened it, he found some things that propelled him into the middle of a mystery involving, well, you'll have to listen to the book to find out what. It is San Francisco during the 1930s, and Jonas Watcher must solve The Case of the Running Bag if he wants to stay alive. The publisher's blurb is interesting, but not in the same ballpark as this mystery. The woman is not Brigit from the Maltese Falcon, and she does not do the come on. The Lieutenant is a stand up guy, and the PI turns his life around right quick and shows more smarts than the opening pages might indicate. And yes, the three sisters/fates have an excellent sense of humor. Well written in the noir style, this is a book not to be missed. No spoilers. I got the audio, and Pete Ferrand is good for this one. He has the kind of gravelly baritone that is well suited, and the odd pauses sometimes, but they do seem in character with the personages. Great read! I requested and received this audiobook free from the publisher, author, or narrator courtesy of AudioBookBOOM. A good little whodunit. But I found the narration a bit strange- emphasis and pauses in odd places. Perhaps I am spoiled by Humphrey Bogart but a better narration would much improve the overall rating. Oh, those fickle sisters, Fate. While Mystery isn't my normal genre to read, I enjoyed The Case of the Running Bag. It was easy to imagine the scenes, and the narrator did a great job of giving each character a distinct voice. Mr. Poschman weaved the story seamlessly, and told it with tongue-in-cheek humor through the eyes of Jonas Watcher, a drunk that is thrown into a role that fits more with his past than anyone suspected. Oh, those fickle sisters, Fate. You never know what twist they'll throw at you next. I enjoyed this book so much I listened to it twice. 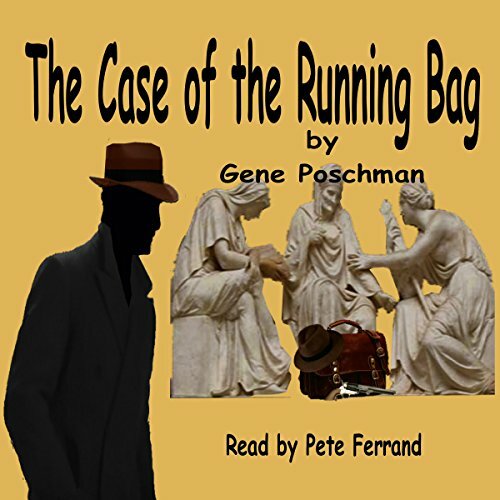 The Case of the Running Bag is a fast-paced, humorous noir yarn starring the affable Jonas Watcher. The plots twists and turns in unexpected ways and Jonas rolls with the punches with good humor. The narrator did an excellent job. I enjoyed his performance. He brought Jonas to life and kept me on the edge of my seat at times. I especially loved the interactions between Jonas and his witty secretary. What a fun story. Do yourself a favor and give it a listen! You won't regret it! Did not like the narrator’s hesitating rhythm, almost like reading a facts list. Strange characterizing. The story line was unrealistic and unlikely. The main character is a drunk who wakes up on a dock, gets hit by a bag (apparently on purpose, why?) The bag has money, a gun and PI’s business card. (who wants to throw away money and a gun?) Then he just goes to the PI’s office and takes over the man’s job. Kills a strange guy in the office (with the gun he got from the bag) and the police is just so happy for his help? Does not worry about where the PI has gone, the stranger in his office, the unregistered gun? Really? "... a woman laughing in the background." I loved this book. When it first started, I was uncertain about the narrator's voice: the deep, gravelly tones suited the story well. But there were odd little pauses here and there ... it didn't sound like the smooth performances more usually heard. But as the tale progressed, I realised how wrong I was and how perfectly the whole production suited the character. For this is the story of how Jonas Watcher, an ex soldier, now full time drunk, literally falls into (or was hit by) his first job and becomes a private eye. Told as if by Watcher himself, Philip Marlow style, this might not be literary genius but is certainly a well written and often wry humoured detective noire. And Pete Ferrand simply becomes Jonas in the reading. O.K. his other character voices can be surprising but they are distinctive in conversation and all add to the enjoyment of the story. My deep thanks to the right's holder who gifted me a copy of The Case of the Running Bag. Good mystery story, great characters with depth and personality and an enjoyable narration. And even funny, too. Yes, I loved it and would recommend it to anyone. Plus I will be looking out for more in this Jonas Watcher series. The narration of this story doesn't meet my expectation. It was clipped and the timing and cadence was off much of the time but the story kept my attention.